Many rats can lose the use of their hind legs, often during old age and caused by different factors. If you have a rat who begins dragging his hind legs, please see a vet as soon as possible. If it's determined that the ailment is degenerative, this can mean the rat will totally lose the use of his hind legs, but he may still be able to drag himself around with the use of his front legs and handpaws. However, doing so will be stressful. You can help lower the stress level by offering your rat ways to function more like a normal rat. This can include walking, eating, self-cleaning, and enrichment activities such as chasing feathers. 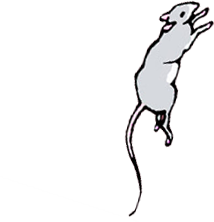 This gallery has examples of ways to help a rat with hind-leg difficulty. Adding a ramp to a cage to assist rats with early hind-end nerve degeneration. 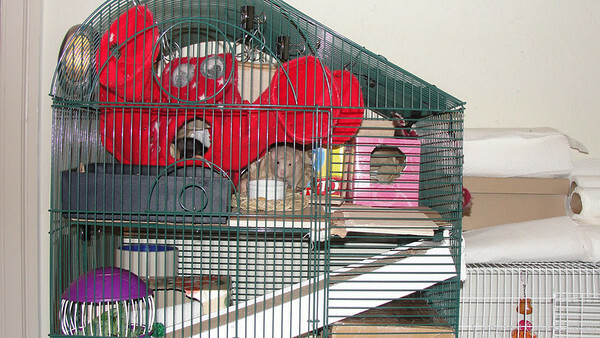 This is a bird cage where the levels are wide apart, wider than would be found in a rodent-specific cage. To reduce the amount of climbing required, cardboard boxes now layer the entire floor, raising the floor level and reducing the amount of space between the levels. The ramp is a cardboard cat scratcher thing (minus the packet of catnip that came with it). It rests on boxes of a particular height that keep it at an ideal angle, and a bowl at the bottom holds the ramp in place. The cardboard is soft and yet offers an excellent grip. The old lady rats have chosen not to gnaw the ramp into shreds, but if they wanted to, they could for enrichment. The rats are also litter-box trained and have expressed no interest in peeing on the ramps. However, their human is quite willing to replace the ramps if needed.